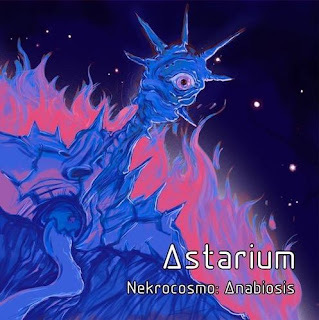 This is a review of another recording from Russia's solo project Astarium which shows the music moving away from symphonic black metal and going into more of a sci-fi ambient direction and the demo is called Nekrocosmo: Anabiosis" and was released by Wolfmond Production. Field recordings start off the album along with some ambient style synths a few seconds later which also mixes in elements of neo-classical and dungeon synth while also adding in a variety of many different sounding keys as well as most of the tracks being very long and epic in length. At times the music captures the atmosphere of a science fiction film while also adding in a small amount of drones along with some programmed beats also being added into some parts of the songs as well as the album also having its cinematic moments and all of the tracks are instrumental and as the album progresses the music starts getting more diverse. On this recording Astarium moves away from the symphonic style of black metal that he is known for and creates an album that is more in the sci-fi vein of dark ambient while also having some dungeon synth and neo-classical elements as well as keeping everything instrumental and the production sounds very dark. In my opinion this is another great sounding recording from Astarium and if you are a fan of sci-fi orientated ambient, you should check out this demo. RECOMMENDED TRACKS INCLUDE "Pulse Of Kali Yuga" "Eternal Occultation" and "Philosophy Of Black Hole". 8 out of 10.